This entry was posted on April 23, 2014 by Paul. Technology is everywhere these days - so are the health risks that have come with the rapid spread of electronic equipment. Studies have found that keyboards and mice can harbour more bacteria and germs than door handles or even toilet seats, not what you want in a healthy and productive workplace. Certain environments need to be more conscious than others to the dangers from bacteria that can lurk in places such as computer keyboards, mice and other desktop peripherals. Laboratories, hospitals, care homes and many other working environments need to be able to ensure equipment is always spotlessly clean in order to prevent the spread of infection. That’s why we have recently extended our range of fully washable, medical grade computer accessories. 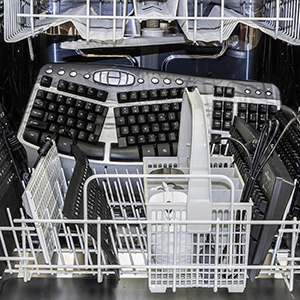 You now have a wide choice of keyboards and mice that can, if necessary, be put in the dishwasher at the end of a day’s work to ensure that dirt or crumbs that may have got into them are safely removed. Many of the devices also include an antimicrobial, fungi static coating to inhibit the growth of bacteria. This anti-bacterial coating is a feature, for example, of Seal Shield’s all-in-one silicone keyboard. Its built-in touch pad conveniently removes the need for a separate mouse while its slimline keyboard can not only be put in the dishwasher but also disinfected with bleach. This makes it a perfect choice for those working areas where stringent infection control is necessary. In other places where day-to-day cross-contamination might be a concern, such as in hot desking areas, Logitech’s Washable Keyboard could be the answer. Designed to withstand spillages and hand washing, it has drainage holes that allow residual water or liquid to drain away making drying quick and easy. Its laser etched and UV coated keys will withstand regular washing or harsh treatment without fading. You’ll find all of our medical grade and washable electronic equipment on our website. But if you want any more information, please speak to your local account manager or call us on 0345 345 0010.